For undergraduate courses in International Financial Management, International Business Finance, or International Finance. 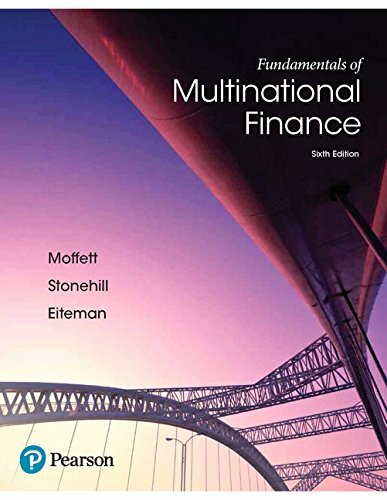 Fundamentals of Multinational Finance helps prepare tomorrow’s business leaders to comprehend global markets and lead organizations through a constantly changing global environment. Via illuminating case studies and real¿-world examples, readers are introduced to the fundamental concepts and tools necessary to implement an effective global financial management strategy. The6th Editionreflects the juxtaposed forces of an increasingly digital global marketplace and a resurgence of nationalist culture and identity. Financial forces, markets, and management are in many ways at the crux of this challenge. This edition reflects a business world trying to find a new balance between business startups like the micro-multinational, a maturing China, a separatist Britain (Brexit), and an attempt by governments globally to channel, regulate (and tax) multinational firms that continue to grow in stature and strength.